Shortly after we got Milo, we thought it best for him to have a companion. Perhaps it would help him overcome his fears. Plus it’s a great thing to have more than one dog. 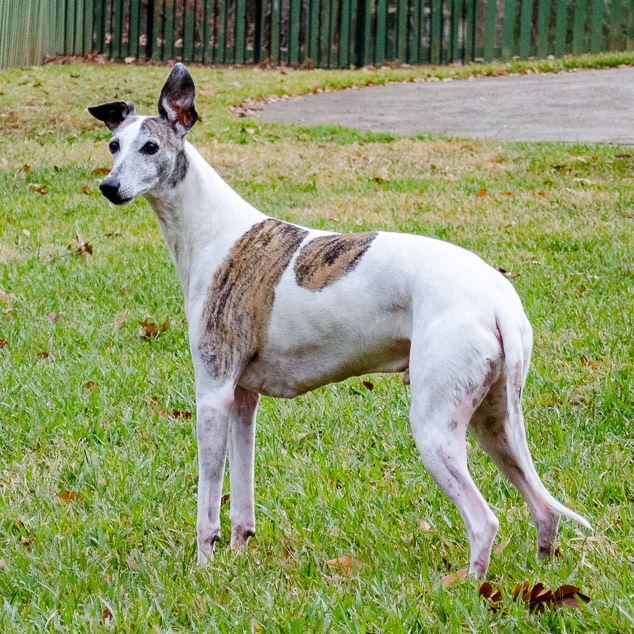 We thought an adult whippet would help teach him fun whippety ways. 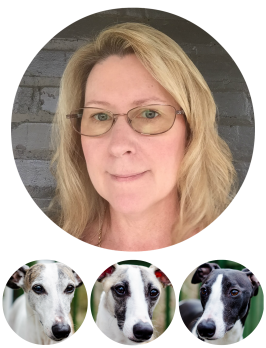 I contacted a whippet rescue organization and, as luck would have it, they had one available. 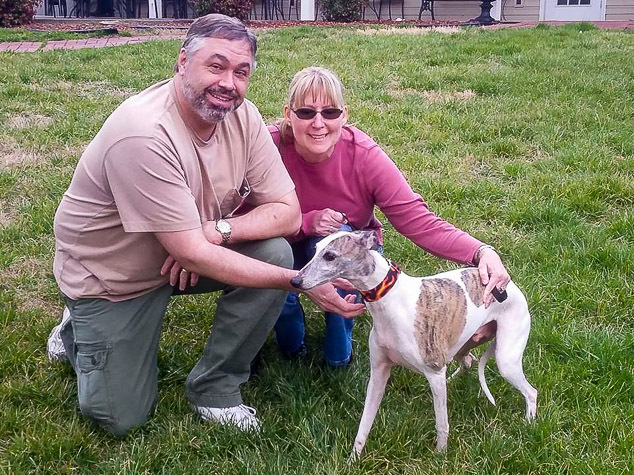 That’s how Zephyr, our rescue whippet, joined our family. Initially, we were told Zephyr was 5 years old. That age would be great. Milo would have a big brother to play with and learn from too. We drove up to north Georgia to get Zephyr. He was so sweet and right away reached out with his paw to us. It was as if he was telling us to take him. And so we did. The day we rescued Zephyr. When we got home, Milo was like “Wheeeeee!! !” as soon as he saw Zephyr. On the other hand, Zephyr was like “Whyyyyyy?? ?” with his great big eyes. Poor Zephyr’s world had changed. He was processing it all; a new place, strange people, and another dog. We found out Zephyr was 9 instead of 5 years old. That puts him in the older dog range. He wasn’t playful as we were hoping. 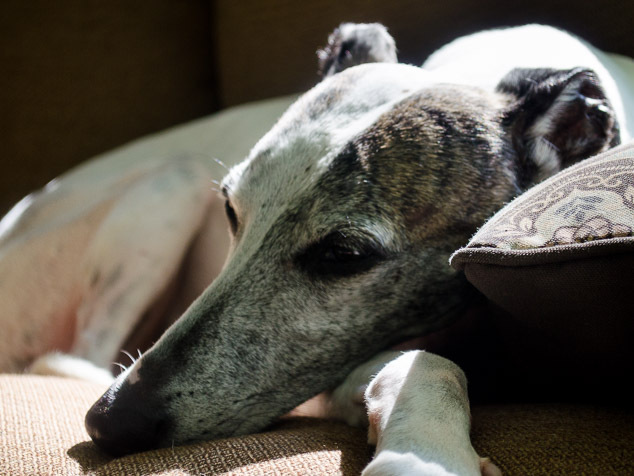 As with most of older whippets, he just wants to chill out on a comfy spot. Zephyr sleeping in the afternoon sunshine. Zephyr did become a good older brother. Milo seemed a tiny bit more relaxed with him around. It was evident when Milo followed Zephyr upstairs. Before Zephyr, Milo wouldn’t venture around the house at all. The only way I could get Milo upstairs is to either carry him or lead him on a leash. 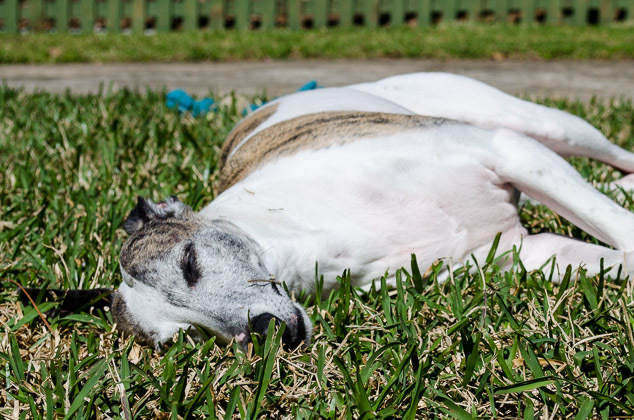 Zephyr loves to lie on the grass and soak in the sunshine. He also enjoys sitting and watching for critters in the swamp behind our house. He’s a naughty counter surfer and opportunist. He watches and knows when I walk out of the kitchen and there is something on the counter. He’s helped himself to a raw halibut filet and an Italian sandwich. All food has to be kept out of his reach. Zephyr is so happy lying on the grass and soaking in the sunshine. He is a sweetie. Well, except for two things. One is he is aggressive to other dogs (not ours). He will attack any other dog that comes near. The other is he doesn’t like to be handled. He’s snapped at me when I’ve tried to move his legs. It’s unusual behavior for a whippet, however, I have no idea what his previous life was like. Zephyr listening to a noise in the swamp behind our house. Our home is Zephyr’s fourth and he is here to stay. He’s our rescue whippet and a great older brother. He got Milo to where he relaxed enough to want to play. However, Zephyr is an older dog and not so playful. Milo’s progress stalled. And that’s what lead us to the decision to get a puppy. The story continues with Luke. Do you love whippets? Take a look at these fun whippet dog products on Amazon. (Affiliate link).